Later, I had my diesel pumped off by a local boaty company. They were clearly going to use it for heating and charged me for the privilege of giving them 600 litres of fine free diesel for that purpose.. When you’re desperate, people can do anything they like with you. That same night, the uniforms turned up again. They seemed anxious I hadn’t actually paid up, but apparently had to give me a receipt for the payment I might not even have issued, and give me my boat engine keys back. I was pleased to get rid of them and wrote a nice long email to their boss about them contaminating my tank with their receptacle, and the navy boat ramming my boat (their moronic driver had actually scraped along monster’s stern), and so on, before venturing out on a serious mission to sample the Blankenberge nightlife. The next day a suitable Belgian-lager-fuelled hangover helped me in my decision to cross the channel and get on with my voyage. Forecast conditions with a NE4 looked ideal for the 75 nm journey from Blankenberge to Dover. 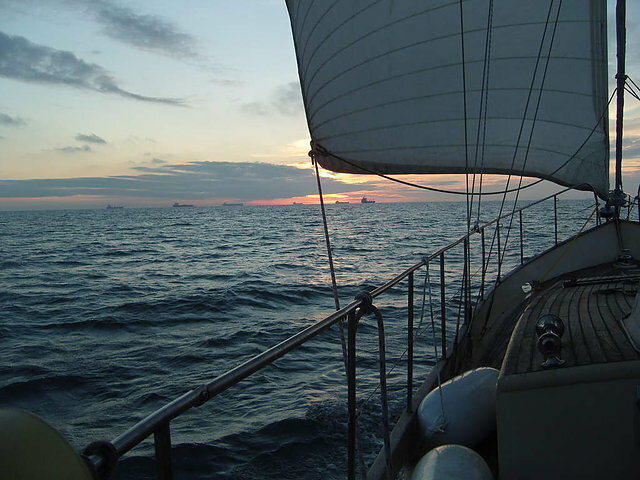 We set out at 0400 and had a long, slow sail in mostly 2 bf winds, which the newly rigged Genoa proved ideal for. Approaching the French boarder we had to pass Nieuwpoort again, and I got some melancholic feelings about what had been my stomping ground for the best part of 2010. My anxiety of getting chased by the uniforms again did make leaving Belgium easier. I was half expecting them to turn up in a submarine and kept a nervous eye on the GPS-charted position. 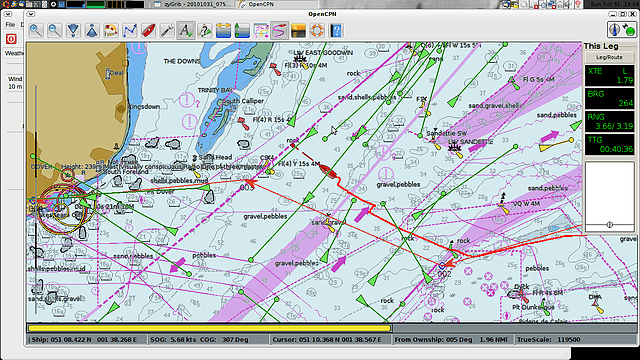 In the evening, we crossed the traffic separation scheme just off Dunkirk.. Ernst was keeping a visual lookput whilst I was interpreting the charts and AIS plots on the free software chartplotter opencpn as best I could. The AIS proved invaluable; as you can see from the screenshot, it was rather busy and we had to zig-zag on occasion to avoid getting run over by the huge beasts. In the dark, trying to work out where these freighters were headed, I felt like I was on some mission in the classic German film “Das Boot”. In the end, I lost my patience and starting motoring full steam ahead to get through it. 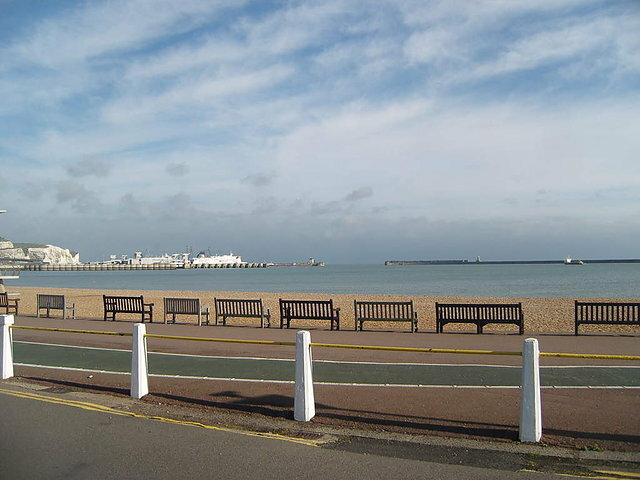 We did some more sailing up to Dover, where we had to wait for some ferries before being granted permission to enter – this being necessary as Dover is one of the busiest ports in the world – when the engine failed just inside the outer harbour. Instead of panicking, I just put down the anchor immediately and requested tug assistance. Textbook. The harbour patrol vessel’s skipper greeted me with the words “can’t stay there mate” and proceeded to bring me right to my berth in Granville dock. There was no fine and no fee, as he declared it “assisted docking”, which is apparently free of charge. I was rather pleased with that. The next day, Dover welcomed us with some nice sunny weather, and I felt quite chuffed to have made it to England on my own keel, before starting work on my various boaty problems.